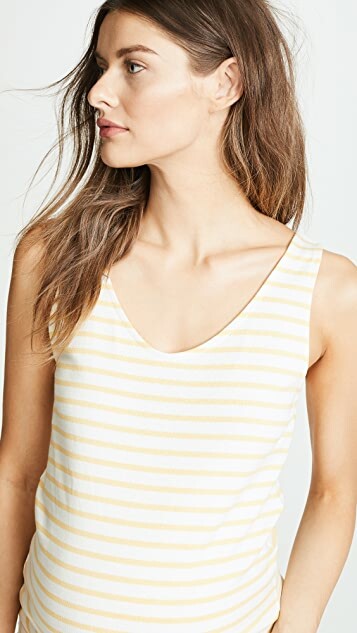 A relaxed HATCH tank dress with our favorite pattern. We've said it before, and we'll shout it again, you can never go wrong with stripes! I love a striped dress and bought this one during the Black Friday sale. I always find Monrow are not very generous with their sizing - I am a US 10/AU 14, size Large, so always buy Large in Monrow (and am not always successful with that size and fit). This dress has sufficient stretch to fit well but I was disappointed with the length. It hits my knee and I am 5'3 - I like my dresses to sit a bit lower than knee length. It is unlined so I will have to be mindful of the underwear I wear. I love the tie at the front - it is a lovely detail that accentuates in a slimming way the waist and draws attention away from a tummy :) A great casual item that is sure to get a lot of wear! I love to wear Hatch both pregnant and post-baby - their pieces are so stylish and translate to an everyday (not just maternity) wardrobe. I cannot go past a striped dress so this was a great buy. However, I am currently 3 months post-partum, back to my regular size save for a small mum-tum!! (a size US 10/AU 14) and goodness me, there is NO WAY this would fit in the third trimester. I was lucky to gain very little weight during pregnancy, I was all tummy, but this would have absolutely struggled over my tum in even the second trimester. If you're a small size it would do well as a maternity dress. My current size just fits. Material is thick and a heavy weight cotton jersey. I'm 5'3 and it hits at my knee. Purchased in blue stripe and it's such a gorgeous colour, I will definitely wear when I am no longer breast-feeding (no access!). Shame about the sizing!